The Challenge: Do something your parents would never let you do as a child. The word “never” in this challenge really stumped me. My parents were strict but not militant. As I thought about it most of the things they “never” allowed us to do were really for our own safety. After some soul searching I realized there was one thing: eating dessert first. My parents would never have allowed this. So, now that I am in charge, why don’t I do it more? 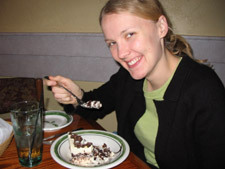 Jason and I decided to head out to dinner, so I picked Olive Garden because I remembered seeing a yummy dessert that I’d like to try- chocolate lasagna. When it came time to order I told the waitress I would be ordering dessert first. She admitted that she would like to do that more but feels too embarrassed. It did “feel wrong.” I ended up getting an appetizer for my entrée. I was so stuffed. I felt like quite the dinner rebel. I highly recommend it! When I was a wee lad, I was enamored by Play-Doh®. Especially the smell and the way it felt in my hands. I even had a Play-Doh playset: The Fuzzy Bumper Barber Shop. It was awesome. There was a little plastic guy with holes in his head. You’d jam Play-Doh into his noggin and put him on the barber chair. As you’d push down, the compound would squeeze out of his head, creating a beautiful head of pink or blue or brown hair. There may have even been a beard/shaving element to it as well. The trouble was that my mom never let me play with it. Ok, maybe that’s a slight exaggeration, but I swear I can count on my hand (with a few fingers chopped off) how many times I did. On the blue moon when I was allowed to play with it, it was at the kitchen table. I remember being surrounded by some sort of plastic tarp, and a hermetically sealed white NASA space suit might have been involved. Anytime I asked for one of those Play-Doh food kits — I LOVED those tiny hamburgers — I was always denied. Today I went out and bought myself the Fuzzy Pet Parlor for $7.49. It was the closest thing to a barber shop I could find. I got home and created some very trendy hairstyles on various pets. I even — get this mom — played with it on the carpet! This morning I did something I’ve always wanted to do growing up – I slid down the bannister! I think my size may have taken a bit of fun out of it as it is not a super long bannister therefore making for a short ride 😉 Even though I’m 33 years old, I still felt a little thrill in “sneaking” a ride! This is a good one! My dad was a volunteer fireman and many times as I was growing up I remember the phone ringing a steady ring signaling a fire call. So playing with matches and fire was a no no! Smoking was not allowed either. Neither of my folks smoked. And the one time I “found” some smokes I tried smoking them behind the old garage and all was going well until old pop came around the corner and wanted to know what I was doing. Being the “smart” lad I was I put the cigarette out in the palm of my hand and all was well until I screamed out in pain and the smoke fell to the ground. So in honor of those 2 can’t dos I started a fire in my back yard and burned some tree trimmings and leaves from last fall and smoked a big fat cigar thank you! I can hear my mom now, “no ball playing in the house!” So, I went out to the garage, got a basketball, fired up for a dribble and THUD! Guess the ball being out in the frozen garage doesn’t make it ready for a game of one-on-one. 🙂 But it was a loud few thuds and I felt like a rebel nonetheless. I did a couple of things that my parents would strongly disagree with. I stayed out past my curfew. I stayed awake unitl 2:30 Am, and I ate Ice cream for breakfast. So, eat it parents. My mum is a pretty liberal person and didn’t disapprove too much of whatever I did back in the day, apart from one thing: banging on things. It. Would. Drive. Her. Nuts. Like many kids who want to be drummers (uh-oh! ), I’d take whatever looked like drumsticks and bang on anything resembling a drum: pots, pans, tubs, jars – whatever came to hand. Well, yesterday (Sunday), I decided to make a drumkit out of everyday items, and play along to one whole song. My bass drum was a small washing basket laid upside-down on the floor; my snare was a casserole pot; my tom was a frying pan; and my ride was a chinese wok (all placed on the coffee table). A pair of knitting needles were my drumsticks. Needless to say, the racket was LOUD, but AWESOME! I played along to The Riverboat Song by Ocean Colour Scene and had a blast! I had to pass on this one. I couldn’t think of anything that my parents forbade me to do that I would actually want to :(. Today I watched tv before my work was done. AND I can’t be grounded for do so! Bwahahahaha!